By the way these infernos look, if someone told you that what really is happening inside, is star formation, you might believe the claim. But the X-Ray image taken from Chandra shows that only one "recently formed" star exists within the pillars, suggesting the Eagle Nebula is "past its prime in terms of making stars".1 And "recently formed" is not very recent. Star formation from a compacted cloud would take many generations of astronomers to observe. So when star formation observation is mentioned, we are not talking about real-time events, but rather, a derived conclusion based on several assumptions. How likely is natural star formation? Well, if you give them infinite time, you may hope some stars would form. But there's one big challenge they would need to overcome to form. The repulsion forces between gas particles are much greater at close range than the gravitational pull that attracts them. You would need some sort of an outside force to help to "sqeeze them together". If today's star formation requires some stretching of the physical laws, the initial star formation is even more problematic. All the current theories of star formation require pre-existing stars to form new stars. Those theories are namely: shocks from nearby supernova and compression with collision with nearby galaxies. Galaxies are composed of stars, and supernovae are exploded stars. So you need some pre-existing stars to even begin considering likelyhood of new star formation. The implication is, where did the very first stars come from? 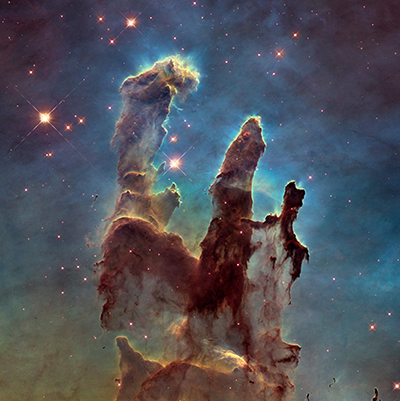 These are the Pillars of Creation, and they are the masterpiece of God's creation.